Okay, maybe the music choice at the arena during yesterday’s Zamboni breaks was a premonition of sorts? The Men’s Short Programs today seemed to follow the trend of the Pairs Short programs — sloppy and in some cases, quite shocking. For an event with so much depth and potential firepower, we sure saw a lot of mistake-filled mayhem today. In a field with so many medal contenders, hope reigned supreme as the Short Programs began. But alas, it was not meant to be. Some long-shot medal hopefuls like Nan Song and Tomas Verner fell out of the top ten. Some not-so-long-shot contenders like Takahiko Kozuka and Artur Gachinski did the same. And that was only a taste of what we’d see. There were great hopes for the American men in Nice. Both seemingly skating well enough that a top-five finish was well within reach. Adam Rippon was the first of the two to skate and his triple flip-triple toe combination set things off just right. But the pesky triple axel and a completely uncharacteristic mistake on the Rippon-triple Lutz resulted in technical scores some nine points off the lead. He did his best to keep up the performance, but the component scores (too low, in my opinion) didn’t do him any favors today. 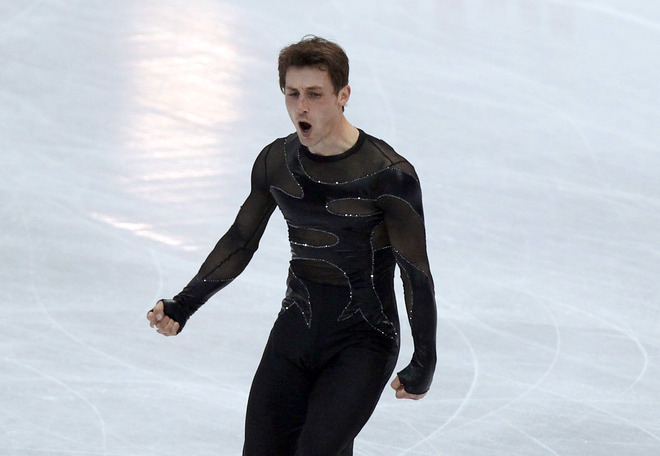 After others had faltered, there was room at the top for Jeremy Abbott. But when he landed a little loose on the first jump in his triple flip-triple toe combo, he tried to muscle the second jump anyway … unfortunately, his efforts were in vain and he went down. A superb triple axel seemed to have him back on track, but a wobbly double lutz did him in. A level 1 call on his upright spin didn’t help gain back any points, either. The good news is, he had the third-highest component scores of the day — less than two points behind Patrick Chan! Jeremy has long been undermarked on his PCS, so that was delightful to see. And just think: a clean program would likely have resulted in those marks going even higher! As I mentioned, it was also not Takahiko Kozuka’s day. He fell on his opening quad toe, then caught an edge on the ride out of his triple axel and went down again. His countryman and co-favorite Daisuke Takahashi had some troubles, too, as he tried — unsuccessfully — to tack a triple toe onto the end of his quad toe at the start of the program. Fortunately for him, though, the rest of his program was superb. Not a single negative grade of execution mark was given, outside of the botched combination. He also had the second-highest component scores — also well deserved. Even Patrick Chan bumbled around a bit today. He was wild on the landing of his quad toe, so he had to add the combination back in later on (which he did beautifully, on the end of a lovely triple flip). And in his trademark footwork, he didn’t look quite over his feet a few times. He managed to stay vertical throughout, but there were a few close calls. And, appropriately, the scores mirrored that. Nothing untouchable about an 89.41. Well … normally. Today, maybe it would hold. At least SOMEONE had a day! So there were a few bright spots today. A few guys lived up to the moment the World Championships can provide and while not all of them have spectacular placements, they have skates to be proud of. Javier Fernandez is a bit of a wild card here. He is more than capable of matching up with the best in the world, but he doesn’t have the “big game” experience that tells you how he might perform. Well, he came in after a hot mess of sloppy programs, and threw down a quad toe, triple lutz-triple toe combo, and a scratchy-but-rotated triple axel. Oh, and a whole heap of charm and personality! His coach, Brian Orser, expected higher scores for his young protege, but nevertheless, this was a skate to be proud of. Brian Joubert came out, all guns blazing and tried to steal the show, too. He had a quad toe-triple toe combination, a triple axel, and a triple lutz that reminded us how he’d been at the top in the not-too-distant past. Sure, his choreography is a little lacking compared to the very best. But with the boost of the French crowd, he squeezed every ounce out of that performance. I was happy for him. The biggest surprise, though, was Michal Brezina. Yes, he’s had some success this season. But normally against unimpressive fields. Don’t get me wrong, he deserves the praise. He has this Short Program so ingrained that I’m positive he could do it blindfolded. And it’s no slouch of a program, either. A triple axel, triple flip-triple toe combo and a quad salchow late in the program? That’ll do! His PCS aren’t quite Abbot/Takahashi/Chan-esque, but when you deliver those goods (and no one else does), it works just fine. Theoretically, it’s certainly still possible for the Americans to move up and snag that magic number 13 (to gain a third team spot for next year). Sixth and Seventh place would do it (or fifth and eight, fourth and ninth … you get the idea), but that means making up 5+ points over the three ahead of them. So that’s the task at hand. Now if it was only so simple! Here’s to a more inspiring free skate for the men on Saturday! Yesterday after the Russians struggled so mightily in the Short Program, they brought to our attention that the ice in Nice is, well, not quite right. It cracks and crumbles right out from underneath the blades, they said. Now, you would think that if the ice was really all that terrible, we’ve had heard a whole lot more about it since then. Before you start to protest, simmer down! I’m not trying to stir any proverbial pot or cry “conspiracy” or even call out any particular pair for comments on ice that I have not had the privilege of skating on! In fact, after this morning’s Ladies’ Short Programs, I’m beginning to think maybe their right! As an American skating fan, I can’t deny my vested interest in the success of Team USA. So … let’s start there. Ashley Wagner, since winning her National title, has been determined to lead the team that regains a third spot for the American team. And after her Four Continents performances, I was pretty well convinced she had the firepower to do it. And with Alissa Czisny — who can stumble a bit and still rake in scores on the spins and components — certainly in a position to peak, that third spot was not only within reach, but anything short would be a serious disappointment. … today was a serious disappointment. Wagner was the first of the American’s to skate, and she had high hopes of starting things off with a triple flip-triple toe combination. That vanished with the landing on the first jump. The extra turns could be costly in and of themselves in the GOE department, but now the combo had to be tacked onto the triple loop. She managed to do that and complete the elements, but she had to have the technical edge in order to keep up with the skaters at the top (who, might I add, were not the skaters we’d all predicted, either! But I’ll get to that.). By the time Czisny took the ice, there was a cavern at the top of the standings, as favorites continued to fall. Trouble is, so did she. Twice. And she barely hung on to the double axel. My heart was breaking for her — you see the effort, the potential, the desire to finally live up to her own vast expectations, only to see everything that could go wrong, go terribly, terribly wrong. The two sit in 8th and 16th place, and are almost certainly out of reach of the magic number 13 to get that 3rd spot. At least a couple of skaters left the Short Program happy after strong skates! It was Russia’s Alena Leonova who was the surprise leader. She skated her best short program all year, complete with 3-3 and quirky, complicated footwork. Also a surprise was Japan’s Kanako Murakami who nearly matched Leonova element for element on her way to a second place finish, just two points off the lead. It was a disappointing night for both Carolina Kostner and Mao Asada — perhaps considered co-favorites here. Asada skated first, and crumbled on her opening triple axel (a move she’s remained committed to, despite a lack of success). The result? 1.8 points out of a possible 8.5+. Ouch. Kostner started much better, hitting her own triple toe-triple toe. But, as so often happens, she followed that with a mistake — a double loop, in stead of a triple. And that was enough to cost her, despite having the highest PCS marks of the night (she was the only one to break the 30-point mark). 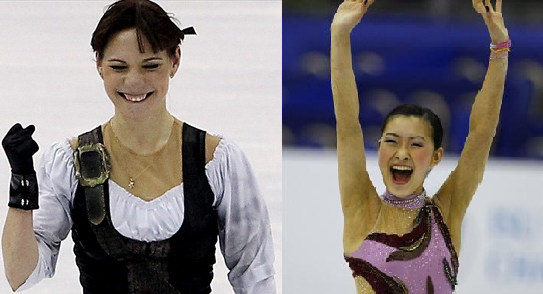 In my world, I would have had Akiko Suzuki over Kostner in the short. But, she doubled a lutz that also got an edge call, resulting in a negative GOE on that element. Ksenia Makarova had the skate of her season, and it was good enough to land her in 6th, just ahead of Elene Gedevanishvile, who was well on her way to a fantastic skate … until she singled the axel. So, the battle lines are drawn for the Free Skate. Realistically, the top ten could shift dramatically. There’s not a lot of consistency to speak of among the ladies currently in those spots. That might bode well for Wagner, who as been a stronger Long Program skater than others. It also means, everyone is going to have to shake the demons and shoot for the stars, holding nothing back. There can be no fear. No mind games. Just muscle memory and confidence. They have a day to rest. And, hopefully, the gremlins are gone for good. She had only skated one clean program since the 1998 Olympics. After placing second in qualifying, and third after the short, she was in the “worst case scenario,”meaning she needed the leader — Maria Butyrskya — to finish 3rd or lower, and she needed to win the Free Skate. Plus, she was skating first. Then, the haunting vibrations of The Red Violin swept through the Palais des Exposition and Michelle Kwan crafted, perhaps, the most magical moment of the 2000 World Championships. Every move was assured, from the opening triple loop, to the stunning triple toe-triple toe combination. Her spins were improved, her footwork was quick and sharp, and her presentation was, well, Kwan-esque. There was nothing she needed to do in that program that she left undone. No extra turnout on a jump, no slippery edge in a transitional step. Not even a finger misplaced. She skated both the most technically difficult program of the night, and the most emotionally complex program of the night to win her third World title. Michelle Kwan became the first American woman to reach that mark since Peggy Flemming. Michelle had officially reached legend status. Now, some 12 years later, a pair of American girls hope to follow in the path the Flemmings and Kwans of the world made. But, it won’t be easy. The number of ladies who could win this title is a little ridiculous. Between Carolina Kostner, Mao Asada, Ashley Wagner, Akiko Suzuki, Alissa Czisny, and Alena Leonova, things could get a little crazy. But then you throw in Kanako Murakami, Valentina Marchei, Elene Gedevanishvilli, or Viktoria Helgesson, and it gets even more dicey. Carolina Kostner is, perhaps, the closest thing to a “favorite.” She presents an interesting situation, though. She doesn’t have a triple lutz, and has only recently added a triple flip back into her programs. Some find that terribly unjust, when there are other girls (including Ashley Wagner) using all of the different triple jumps. But, what Carolina has is win-induced confidence. She’s had a stellar season, and she knows it. That could play very nicely into her hands, as she’s the only lady to take the top of the podium consistently all season. Ma Asada is a former champ. She’s struggled the last few years, dedicating herself to reworking her jump technique. And it shows. She’s back to smiling when she skates, and floating across the ice, and making triple jumps look easy. At least most of the time. She still has a tendency to underrotate jumps, and she gets a little off and pops a jump or two here and there. Asada is talented to the max, but far from consistent. Alissa Czisny has all the qualities you want in a great champion. All except consistency (yes, I sound like a broken record. There’s an obvious pattern developing here.). To get on the podium, she needs to skate two clean programs. Clean Programs. She can’t miss her jumps, because she doesn’t have the complexity in the choreography to make up for it. As much as her spins wow us, they can’t do all the work. She seems motivated, though, and this could be her time to shine. Suzuki and Leonova tend to be hit or miss. Akiko has effortlace elegance on the ice. But she can crash and burn on occasion. As can Leonova (who doesn’t share the same elegance in the least). Despite all of the possibilities, all eyes may be looking towards American champ Ashley Wagner. Not because she’s been there, done that, but because she hasn’t, and yet she notched a score at Four Continents that put the rest of the world notice — she has arrived. And with even more planned difficulty in Nice, could she take her third title in a row? There is a part of me that wants to go all in, to believe in the improbable. She’s charming me more and more with each competition, and it would do my heart good to see her win. But, there’s too much unpredictability in this event to call it her way just yet. In fact, calling it at all is almost pointless but, here’s my attempt. Who will take the challenge head-on and who will get left in the dust? However it unfolds, I hope we’re graced with at least one program that sticks in our minds the way Michelle’s The Red Violin has. That was the announcer’s description of Marina Anissina and Gwendal Peizerat’s World Championship-winning Free Dance in the year 2000. The duo — who had finished second the two years before — won their first World Title in front of their home crowd, capping off an undefeated season, to boot. Marina and Gwendal were second headed into the Free Dance, after placing first in each of the two compulsory rounds, but second (to Italians Barbara Fusar-Poli and Maurizio Margaglio) in the Original Dance. To win the title, they needed to finish strong. Their Free Dance to the ever-dramatic Carmina Burana was masterful. The speed and precision was matched by intensity and passion. Their elements were woven in and out of the uniquely crafted choreography. You could feel the tension in the building, the French crowd seemingly willing them to victory. The noise level built steadily throughout, and when they hit their signature lift — yes, the one where she does the lifting and he does the posing! — there was no stopping the eruption, or Mama Anissina’s tears as the camera flashed to her in the stands. It was the moment they’d been building towards, planning for, and dreaming of: winning gold on French ice. And they’d done it. Now, there is another French team who has been dreaming of a title, taking a number of turns around Championship ice, but always falling just short. And yet again, they’ve hit a speed bump. Nathalie Pechalat and Fabian Bourzat have twice finished just off the podium at Worlds. This year, they looked primed to take one of the top three spots, until a training accident left Pechalat with a severely broken nose and a need for surgery to repair the damage done. However, surgery would have surely kept them from competing. So, instead they chose to risk it — she skated with a protective mask in practices, taking care not to further the injury. But their determination to skate in front of their home-country fans and create their own French magic has them in Nice, readying to compete once again. Standing in their way, though, is a host of anxious challengers, hungry for their own spot on the podium. Certainly the most likely candidates for medals come from the current hot-bed of ice dance — North America. Kaitlyn Weaver and Andrew Poje are sure to impress in Nice, what with their French inspired Free Dance and all. Plus, they’ve made a steady rise this season and could be set to peak at just the right time. So, too, could be their closest rivals — Americans (and reigning World bronze medalists) Maia Shibutani and Alex Shibutani. Now, a few short months ago (say, before U.S. Nationals), I would have undoubtedly given the nod to the Canadians. They have plenty of miles on their programs this season, they’re comfortable, confident, and committed, both to the character of the dance and to their medal hunt. The Shibutanis, then, were not capitalizing on the potential of their samba Short Dance, and it was costing them. These two had great expectations placed on them this year, after their meteoric rise through the senior ranks last season. But let’s not forget — this is only their second year on the senior circuit! That said, they’ve put in massive amounts of work, not just on their SD, but now on their FD as well, working with dance pro Corky Ballas. And my, oh my does it show, even in the short practice clips we’ve seen. This may just be the ticket to topping the Canadians. The Russian team of Ekaterina Bobrova and Dmitri Soloviev would like to make a podium push, as well. The Russian dominance in Ice Dance for so many years has been seriously lacking. These two would like to change that. However, they themselves are seriously lacking in some areas. They have the skills, but often they lack the quality — which, in judge-speak equals Grade of Execution points. Ice Dance has truly become a highlight of any event, especially at this level for two reasons — the level of depth and competitiveness, and the brilliance of Davis/White and Virtue/Moir. This battle for gold could be one for the ages. Both teams are so equally capable. Their programs are suited to the system perfectly. While some (myself included) find Meryl Davis and Charlie White’s waltz a far better carriage for their skills, others prefer Tessa Virtue and Scott Moir’s Funny Face dance. The reality is, on paper, these two teams are separated by a razor thin edge. At least, they should be. This title will come down to two things … and probably really only one. Take careful note of both teams’ base value mark. If the Americans haven’t upped the levels of some of their biggest elements in the Free Dance, they’ll lose the gold to their Canadian rivals. If they have, however, made the changes, the base values will be nearly identical. In which case, it is all about execution and performance — the PCS marks. The only thing we know for sure is that the fight is on. And because of that, we may just see two of the greatest Worlds dance performances of all time. Yeah, it could be that good. When the dust settles, here’s how I see it shaking out. * I could be wrong, but I think Nathalie’s injury will keep them from surging as they’d need to to overtake the youngsters ahead of them. Competition fuels greatness. We’ll have plenty of both this time around in Nice.